Jeremiah's Vanishing New York: Darwinian City? Last week, the Municipal Art Society held their annual Summit for New York City. Entitled "The City We Want," the two-day event brought urbanists together to discuss and present on issues like improving infrastructure and affordability. There was a flurry of information and ideas, but the talk that's been keeping me up at night came from Deputy Mayor Alicia Glen. She spoke with MAS Director Carol Coletta in a conversation entitled "Fostering Economic Diversity." The discussion followed a recorded #SaveNYC presentation that I wrote and narrated, with photos by James & Karla Murray showing the devastation to our small business landscape over the past decade. Glen replied that the city "should not be making decisions about what are viable businesses." She explained that the city should not be protecting businesses because “there are some small businesses that are probably going to just fail because they’re not very good businesses." She pointed to the outer boroughs, where there is still a "palpable vibrancy," and suggest we not be "so Manhattan-centric." Of course, Brooklyn is getting developed fast. This seemed to be a positive thing. "Hey," said Glen, "it's nice to have a CVS" come in and serve a neighborhood like Crown Heights, "while we in Manhattan go 'Wah-wah, there's a chain drugstore on the block.'" 1. Countless small businesses are shuttering not because they're not good businesses, but because their landlords are doubling, tripling, and quadrupling the rent, or simply denying lease renewals. Time and again, over the past decade, I've talked with small business owners whose shops and restaurants are thriving. But it does not matter. They can't afford a rent hike of $4,000 to $40,000 a month. No business can, except a major corporation. Again and again, when another independent, usually upscale business moves in to the mom and pop's former space, they typically close within a couple of years (landlords are offering shorter and shorter leases). And then the space sits empty. Until a bank or a Starbucks takes it. This is not just a Manhattan problem. What local character remains of the outer boroughs is also being wiped out. And fast. 2. The city government does get involved in who wins and who loses. It does make decisions about what businesses should survive. It does protect some businesses and not others. Let's talk about subsidies and other gifts. The city government hands out hundreds of millions of dollars to companies that it decides are valuable. Good Jobs New York (the original site has since vanished, try this: Good Jobs First) keeps track of these subsidies in their eye-opening Database of Deals. They call special attention to Major Corporate Giveaways, those deals of a most "egregious nature." Corporations like Fresh Direct get millions. 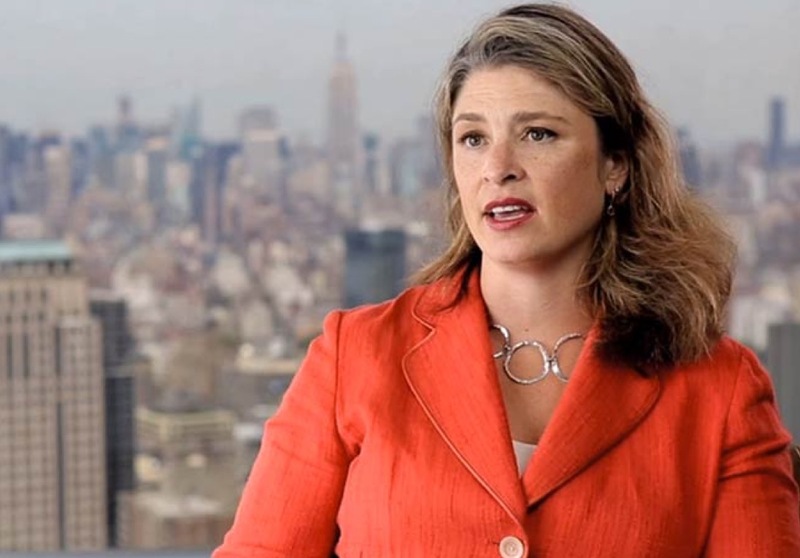 Banks and luxury developers get hundreds of millions. And Goldman Sachs (where Alicia Glen worked in real-estate finance prior to City Hall) got over a billion dollars in post-9/11 Liberty bonds, tax breaks, cash grants, and real-estate deals. Many of these deals were granted by Bloomberg. But what, really, has changed? We're still living under a regime of neoliberal urbanism. Neoliberals claim to be against "big government," but they're all for government intervention when it comes to supporting big corporations, banks, and real-estate tycoons with taxpayer money and property. Ask them to protect the little guy--the middle and working class, the poor--and they'll tell you it's not the government's job. They'll tell you "the market" will work it out. They'll tell you this is just nature taking its course. But there is nothing natural about the city government's role in hyper-gentrification. 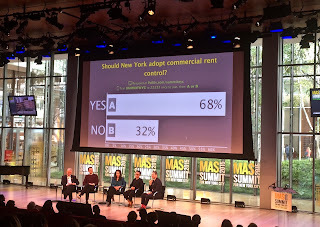 After the discussion with Glen, MAS did a quickie, real-time poll of the audience, asking if New York City should adopt commercial rent control. An overwhelming majority -- 68% -- said yes. The people of this city want change. We want protections for our local businesses. But our leaders in City Hall are not going to give it to us -- not without a fight. 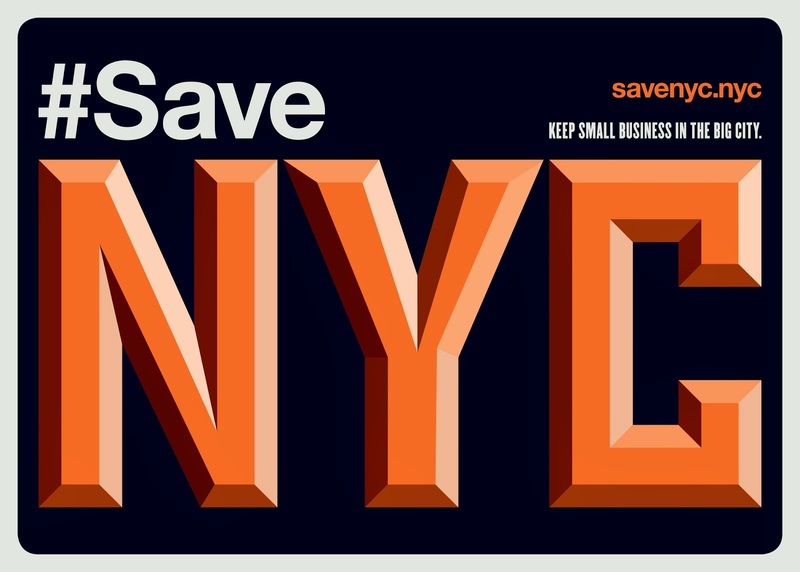 Join #SaveNYC. Join the fight. Take action. N E V E R G I V E U P ! ! ! SOMEtimes, common sense wins.....but 'ya gotta keep hammerin' at them until they WAKE UP! I know it ain't easy, and most times not much fun, but we can stand this issue on its head as long as we NEVER SAY DIE! How depressing that this woman is our Deputy Mayor. And how utterly pathetic that these are her actual views. What are our community boards and city council members doing? We're about to lose any teeth remaining in our landmark laws, we have more homeless, we have greater wealth inequality here in Chelsea than almost anywhere in the country (the numbers make us look like Mumbai), while our politicians and representatives continue to throw the middle class to the side in their desperate desire to pander to wealthy developers and corporations. It is incredibly sad to start agreeing with the old right-wing adage that government isn't the solution - because it is indeed increasingly clear, at least to me, that it's a huge part of the problem. The City's real estate taxes are going up just as fast as the rents. R/E taxes make it hard to keep mom and pops at affordable rents. Excuse you, madam, I live in Crown Heights. We have a Rite Aid and that one is plenty thank you. I'd prefer to go to the independent pharmacy. I would like this same question asked to DeBlasio and the City Council. Are there any advocates for this idea that have come out in support? You can add "Allied Builders" Hardware and Paint, 59 Second Ave. to the list of mom & pop businesses that are in the process of closing. The building was recently sold to a new landlord, who thought it would be okay to triple the current rent of the commercial space to $26,000 a month. Allied has been serving the hardware & paint needs of the lower East side community since 1982. It's not the Mayor's/Deputy Mayor's job to protect local merchants and the people who live and work in our neighborhoods? It's become upside-down world. Thanks for challenging them Jeremiah. The sentiments expressed above are well-meant, but the enormous fact that is ignored is this: if the city were to reduce rents for all small businesses, the owners of the buildings in which they are housed will be hard pressed to pay their property taxes. Most small buildings in the city are owned by individuals, not huge corporations like Silverstein, Brookfield, or Helmsley. And those small building owners, despite the suspicions of conspiracy theorists, are not getting rich. So what do you do to keep small building owners from having their property repossessed by the banks or the city for default on property taxes? Lower the taxes on small buildings? Then who will pay for the city's infrastructure and social services? Where is that missing money to come out of the budget? Schools? Roads? Homeless shelters? Some conspiracy theorists will then say, "Raise the taxes on big businesses!," forgetting that New Jersey and Connecticut will welcome those businesses with open arms and lower taxes when they flee NYC. This is what happened when NYC almost went bankrupt in the 70s (most people don't remember back that far). Before shouting your complaints, it's always best to be prepared to offer a truly viable alternative economical plan, otherwise, the city will simply ignore you, no matter who loudly you vociferate. Preparing that economical plan will take a lot more time and work than just shouting, but it'll be received with much more respect. The person who can come up with that plan is the one who will really be the hero or heroine who will save NYC's small businesses. Anyone can raise awareness; it's the rare achiever who can actually do something. To Scout, I wonder how many billions upon billions of dollars in tax abatement and sweetheart land development deals have been given to the likes of Silverman, Brookfield, Helmsley, Trump etc. over the recent development boom. Tax dollars that would have (could have) significantly limited the property tax increases that you mention, tax dollars that are legitimately owned by all citizens of NYC, but given away by elected city officials to special interests who happen to have close relationships to the seats of power. There's a start, no more special tax deals to developers. If tenets have to pay full price, so should developers. Believe me, NJ & Ct. are not the next NYC ! Well, rongee, like I said - "conspiracy theorists." Unless, of course, you have actual facts and figures that verify claims of "sweetheart deals" that have significantly decreased the city's tax base. I'm always truly delighted to listen to authentic facts and figures; less so rumors and suspicions. Then you're only getting half the story Scout, and these "facts" you rely upon are VERY malleable. Tax abatement law 421a, enacted in 1971 to help with development in a financially strapped city. Still in effect today and recently extended by Gov. Cuomo (it was set to expire in June 2015) This program alone costs the city $1 billion a year in property tax revenue. Forest City Develpoment: $3 bil. One Hudson Yards: $77 mil. Related Co. & Oxford Development: $328 mil. CityLab: Why Billionaires Don't Pay Property Taxes in NY, Kristan Capps, 5/11/15 (This is an especially interesting article, as it gives examples of unbelievable and questionable need for such tax breaks and details who ultimately picks up the tab. Tons more reading out there, available online, detailing the huge tax breaks given to the well connected NYC developers, most of it unnecessary (as detailed by de Blasio when he was public advocate) stating that roughly 82% of development projects in NYC would have proceeded even if tax abatement would have been denied. Those are all merely finite (relatively brief) development abatements that operate on the accepted assumption (whether valid or not) that 5-10 years of development will create subsequent decades of enormous additional tax revenue for the city (to potentially be spent on infrastructure and social services, among other necessary and [to some] unnecessary things). The American/capitalist theory is that a city or business will die if it doesn't continuously grow (like cancer). And so NYC believes that it must continue to grow, to make and spend more money, to build up, up, up. The only time that this theory can be invalidated is when it explodes in our leaders' faces. But who knows when (or if) that time will come? Meanwhile, if the city continues to spend more each year, it absolutely MUST continue to increase revenue. And the only way to do that is to increase taxable property. And the only way to do that is build up. I don't like it; I don't think the theory is sound. But I know that, unfortunately and unavoidably, money drives the city, not human interest stories. One can say, "I speak with my vote," but if you can find a viable/electable politician with enough power to change this paradigm, I believe that you'll have achieved something truly remarkable. To Scout; They may be finite, they may be brief and you may try to rationalize them anyway you wish, bottom line, and my point, they are a waste of tax dollars and in most cases are unnecessary, especially in today superheated NYC real estate market environment. NYC is giving away billions of dollars each year, to individuals, organizations and corporations that are just plain greedy and the least deserving of such windfalls. You may not see this as any big deal, but to put it in a very clear perspective; to paraphrase former Senator Everett Dirksen: " a million here, a billion there, pretty soon you're talking about real money". Thank you for challenging Glen. If the mayor staffs his agencies with former Goldman Sachs execs this is the mindset we get. I don't assume it's malicious - but it is the mindset that problems get solved using the same formula that got us in trouble in the first place. It's also the problem with living in a city with a multi-trillion dollar real estate industry and a country that's been openly overtaken by grifters. How much any one politician can do within capitalism's self-rewarding 'legal' system is a real question, but we can and should require pragmatic policy changes that create and preserve affordable housing and small business. Endorsing and passing laws that can survive a 'legal' test in this current system is not a small hurdle with plenty of room for disagreement over when/if you compromise to get (any?) protections. In my neighborhood every small business (all run by people of color) was overtaken by high-end clothing stores/restaurants. No more tailor, no more shoe repair, no more copy shop, no more bodegas, no more diner, no more nursing homes. Real estate interests dominate and create a neighborhood that serves to provide amenities for those with means - not functional resources for working people.